Mentor India, a volunteer-run platform designed for student empowerment -- especially in government schools -- has now adopted the Brindavan Tent School near Malleshpalya in Bengaluru. Jaideep Rao, founder Mentor India and alumnus Manipal Institute of Technology, Manipal University told Bangalore Mirror that Mentor India was a part of KnowYourStar- a website run by a group of journalism enthusiasts- most of them techies. It focuses on profiling achievers from various disciplines. Jaideep, who was in Mangaluru recently, said each class, from I-V- has 50 students each at the Brindavan Tent School for migrant kids. “These are mostly children of daily wage workers and we intend to work with them throughout the year. Through activity-based learning, we will focus mainly on English and confidence building. We started working in this school from this academic year. Hygiene too will be taught through games and activities. We have to start from the basics, including how to wear a proper uniform, have a good haircut, taking bath daily and so on. Our aim is to turn the place around in a year for which we are looking for volunteers,” he said. He told BM about the challenges the school faces. “Our priority will be to change the ‘I can’t’ mindset that has resulted in low self -confidence. The class room conditions too have to be improved. Students from Class I-V sit in one room. We plan to change the environment and so that children look forward to being there. We have to remember that these are migrant kids and most of them are first-time learners in their families.” He said the team has set certain goals. They are going to focus on changing the classroom set up by making it more child-friendly and with an aim to build a one-on-one friendship with the children this month, he said. “Next month, the team will start off with English curriculum and also start working on their confidence building,” Jaideep said. He was upset on seeing the conditions of the school that is located not far from the city. Teacher Sarala has been with the school for 10 years and has extended support to this programme. The core team includes Anjali Alappat, Pranita Bhat and Nandini Nelson. Mentor India is a platform that exposes students to basic reading and comprehension of English, problem-solving skills, interpersonal skills, spoken English, empathetic skills and help them improve their personality through innovative thinking, listening to stories of role models and getting exposure to new perspectives. The in-house curriculum has been compiled in a workbook called ‘Mitra Pustak’. Volunesia is an attempt at creating something out of nothing. The volunteers who meet at Cubbon Park every Saturday use waste, recycled and given away material, collected by volunteers, to create handmade personalised goodies. These goodies are gifted to the students, mentors and teachers as part of the different activities under Mentor India. Media and Technology have become an integral part of our adolescents' lives. They provide incredible opportunities to communicate, create, gather information, entertain themselves and even build business. However, if digital media is not used judiciously, it can become a weapon that can destroy the teen's world. Hence digital literacy and ethics are extremely essential to keep them safe. Digital literacy is about having the skills to access, understand, question, critically analyze and evaluate online content. (Source: http://raisingchildren.net.au/). Digital ethics means not using technology to cheat. »Spot unreliable websites. Check the domain. Reliable ones are those that end as edu representing an educational institution, .gov represents a governmental organization. Those ending with .com are commercial sites, .org or .ngo represents non-governmental organization and needs to be verified. »Ensure that the content is current and accurate. See whether what has been expressed is a fact or an opinion. »Follow the rules of digital ethics like avoiding use of pirated software, using content legally i.e. following copyright laws and also avoiding plagiarism. »Teens need to understand the concept of digital cheating namely, texting answers, taking pictures of assignments and quizzes and copying and pasting other people's work. »Apply critical thinking skills while evaluating internet sources. 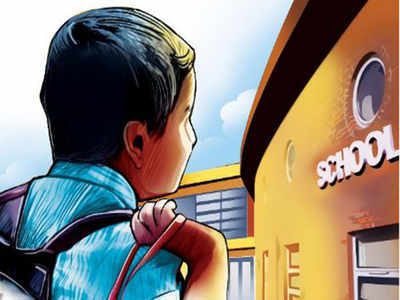 BENGALURU: Under pressure to save government schools from closure, Karnataka may do away with the fee reimbursement scheme implemented under the Right of Children to Free and Compulsory Education (RTE) Act, 2009. Under RTE, the state government pays the fees of underprivileged students enrolled in private schools under the 25% quota. Karnataka is now mulling to stop reimbursing the amount, leaving private schools to face the burden. Sources in the department of public instruction (DPI) said the cabinet would discuss a proposal to relook at the 25% RTE quota in private schools. Arelated law is likely to be passed in the legislature during the next budget session, which would be the last session of the Congress government. "The government had announced in the 2017-18 budget that a new school education policy would be formulated. The new policy covering all aspects, including RTE, is being prepared," said P C Jaffer, commissioner of public instruction. Incidentally, the RTE Act that the Siddaramaiah government is seeking to undermine was enacted by the Congress-led UPA government after extensive consultations. Declining to get into the details, Jaffer said it is up to the government to take a decision on RTE in the state. When contacted, minister for primary and secondary education Tanveer Sait confirmed that the government is looking at re-designing RTE with its main focus being strengthening government schools. "There is a belief that private schools are thriving at the cost of government schools. We need to set things right. The policy is almost ready and it will be placed before the next cabinet meeting," said Tanveer Sait. Karnataka implemented RTE in 2012. While 1,778 government schools have been closed since then, 3,189 private institutions have come up during the same period. Taking note of the decline in the fortunes of government schools, the Kannada Development Authority (KDA) in October submitted a report to the government, urging it to nix RTE.